This post is my contribution to sustainablog’s Pedal-a-Watt Powered Blogathon this weekend. The long-running green blog (and new green shopping site) is publishing for 24 hours straight to raise funds for the Dancing Rabbit Ecovillage in Northeastern Missouri. Go join the fun: read post contributions from around the green blogosphere, leave a comment to be entered in a drawing for some great green prizes, and join in the Tweetchat at #susbppb. 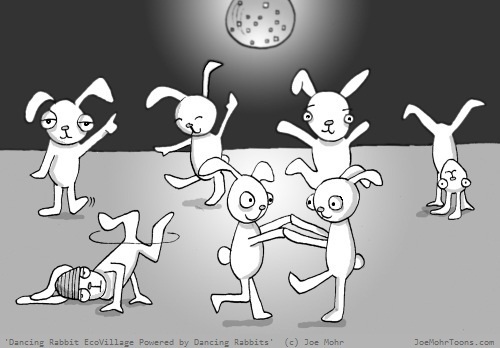 A dance floor that creates energy actually does exist, just not at EcoVillage–yet! I love the dancing rabbits. I also enjoy Hank D and the Bee over at Natural Papa. Keep on drawing!